Progress this past week included piecing not just one, but two baby size quilt tops that will eventually be donated to charity. The top finishes at 38″ x 49 1/2″. 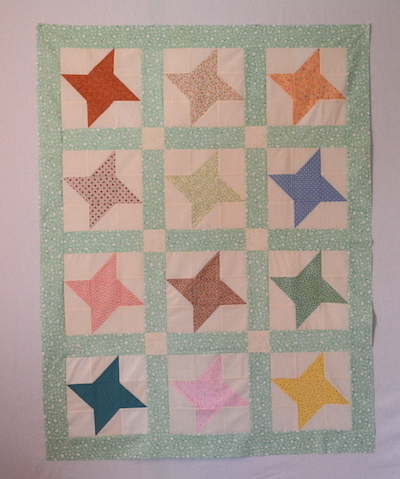 A friend sewed up the friendship stars and provided fabric for sashing and border. I added the cream for corner stones. It is just so much easier to line up blocks when using corner stones. 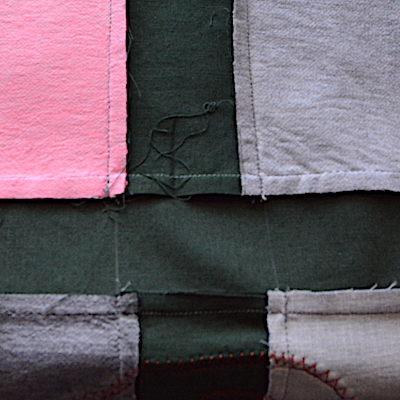 I offered to help stitch up 4 baby quilts using my friend’s 4 sets of 9 1/2″ blocks. She has a wonderful fabric stash, so I’ll go back to her house to ‘shop’ for backing and binding. We might both be working on the quilting. Each do two baby quilts? We’ll see. 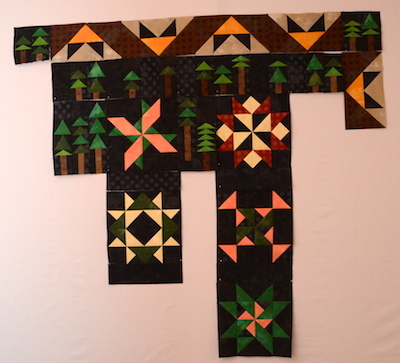 I hope to finish up the 4th quilt top this week. The Square in a Square Mystery quilt is coming along. 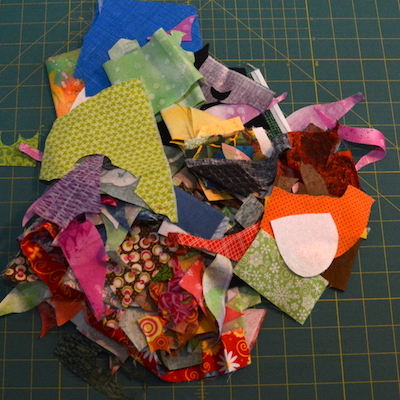 Directions say to use a scant 1/4″ while piecing. I’ve had a dickens of a time finding that scant 1/4″! My Janome came with 3 different feet that are listed a 1/4″ feet. The foot I keep on my machine and gives me an accurate 1/4″ seam – I tried to eyeball a scant, and my blocks turned out too big. Believe me, I tested and tested with stripes for that scant seam allowance, and just could not conquer it with the foot I always use. So I switched to the plastic one – and it just wobbled all over the place so I couldn’t even get an accurate 1/4″ seam! On to the third foot, it’s the metal on with that metal flange on the side for a 1/4″ seam, I could finally eyeball an accurate scant with it and my piecing is turning out at the desired size. Other news. Hubs put together a design wall for me this past week! The above photos are taken on the wall. I do need to learn how to tweak the lighting for photographing. I need a lesson from hubs, so bear with me as I learn! What is on your list to accomplish this week? 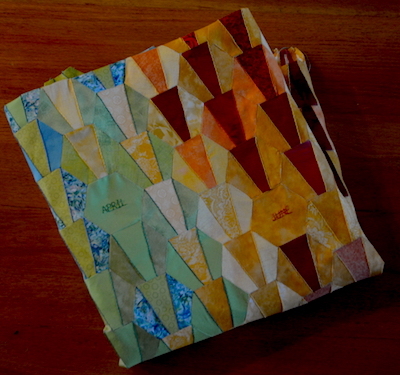 Piecing Square-in-a-Square Mystery quilt. – Working on it but not completed. Piece another baby quilt. ✔️I pieced two! Finish up one more baby quilt for charity. Keep working on Mystery quilt. I’m late to the party. Jodi Barrows of Square-in-a-Square is hosting a mystery quilt that started in January and ends this week. I have lots of catching up to do! I just started last Saturday when I bought the fabric for the mystery. 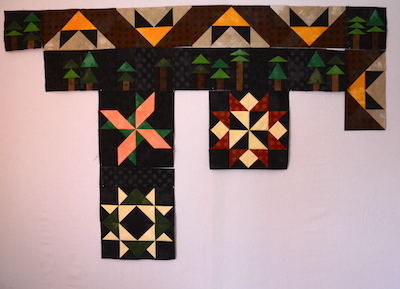 Yesterday, I pieced the first set of blocks which will be used in the border. 20 Winged Creatures, according to the pattern. Today I worked on the second clue, flying geese units, which will be stacked together to make trees. 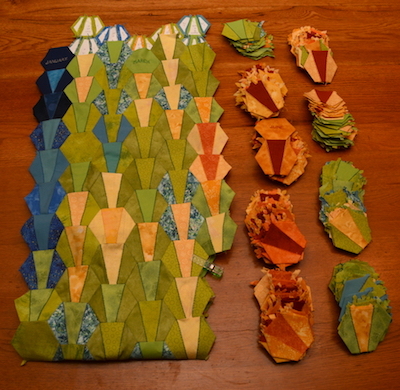 I still have a pile of Square in a Square blocks to trim down to flying geese units, above. 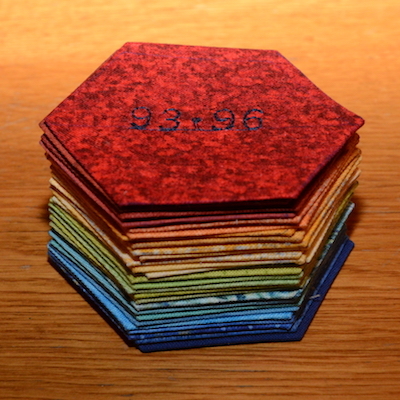 And since I’m still running late, last week – I finally finished piecing together all the hexies for my 2018 temperature quilt. 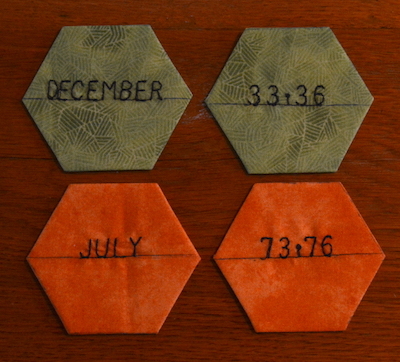 I pieced a three piece hexie for each day last year. The center piece represents the high of the day, and the two pieces on either side represent the low of the day. Personally, I’m tickled to be working on the mystery quilt. Since this quilt has been on my radar since January, it’s like a UFO before I even got started! So far piecing this quilt top has made for a fun week. How is your week going? Any new or old projects on your to-do list this week? 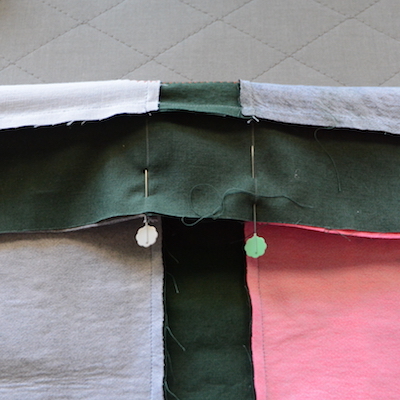 Sew up backs for the 2 UFO quilt tops. ✗ Guess I’m not going to get to these until I’m actually ready to quilt them. 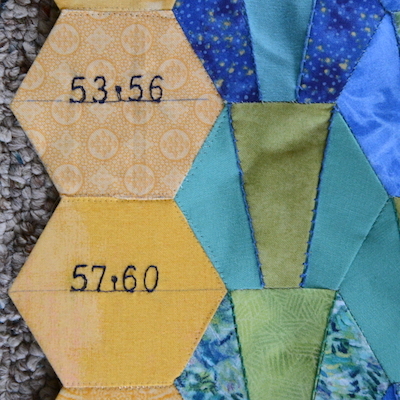 Stitch together hexies for the temperature quilt. ✔️Done! And happy with the way it turned out. 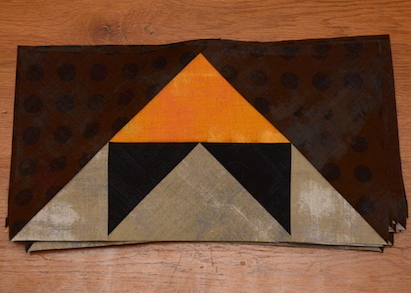 This month I plan on sewing up a mystery quilt offered by Jodi Barrows through her Square in a Square website. My husband gave me a membership to Jodi’s Premium Club as a Christmas gift. Jodi offered a mystery quilt to members that I think started in January and ends the first week of March. I’m hoping to stitch up the mystery quilt this month. 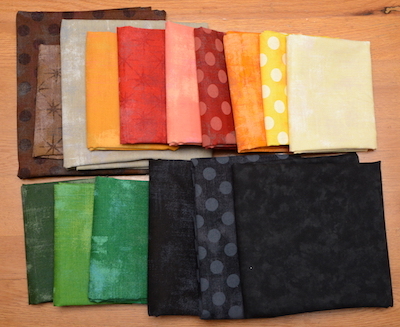 I bought fabrics today for the mystery – Grunge, Grunge Dots, & Grunge Stars. Plus one Marble which is the top black. I’m hoping these all work well together to make a nice quilt top. I missed the cut off day to post my February finish. My 2018 Temperature quilt top is all pieced together. Details here. 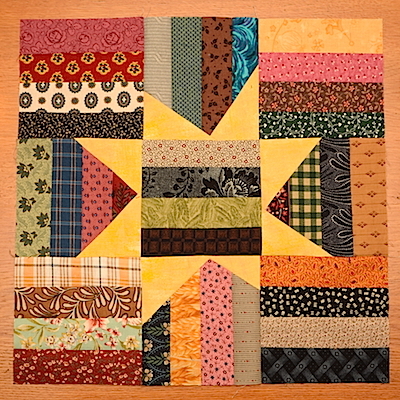 Linking to One Monthly Goal hosted by Patty at Elm Street Quilts. Done! 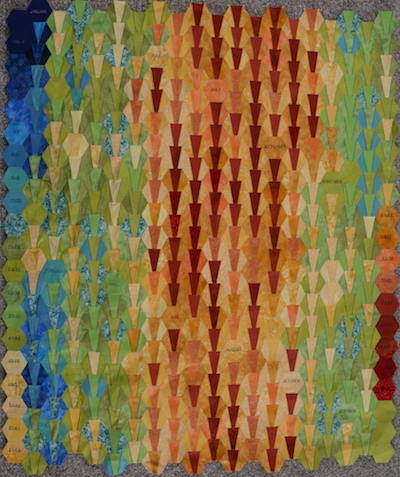 All the hexies are sewn together from my 2018 Temperature quilt. I put the hexies with the embroidered temperatures down the right and left side of the top. This is what the back looks like, some of the papers fell out while sewing the hexies together. 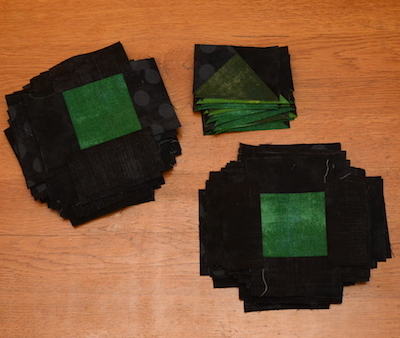 After hand stitching the individual hexie pieces together, I decide to switch to using a monofilament thread and zigzag stitch to attach the finished hexies together. 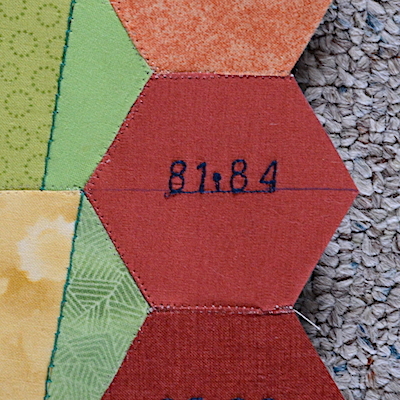 The center of each hexie is the high temperature of the day and the two side pieces are the low of the day. I embroidery the name of the month on the fabric representing the low of the first day of each month. Placing that hexie in the row then followed by day one. For example, here is October (I need to erase my Frixion pen marks.) The high for October first was a warm 83 degrees and the low was 56 degrees. This rust fabric represents 81-84 degrees range. 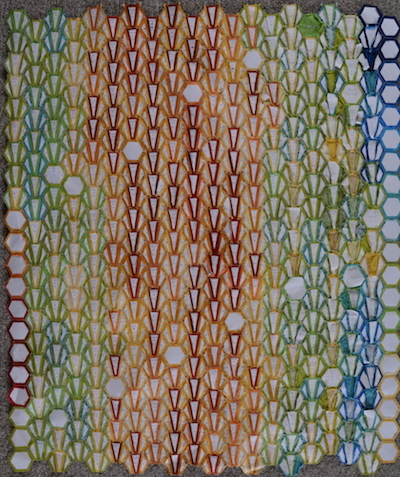 And here you can see the yellow print representing the 53-56 degrees used in the October 1st hexie. Back of the October 1st hexie. 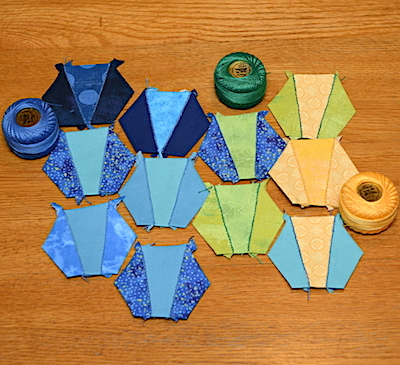 To piece the daily hexies, I used Presencia Finca Perle Cotton embroidery thread in blue, green yellow, orange, or red to coordinate with the low of the day. Top is complete. Now to figure out how to sandwich and quilt it. Let’s just say I threw last week’s to-do list out the window and decided on a bit of Crazy. Happy Crazy. First, I feel in love with Minki Kim‘s book Diary in Stitches. Just take a look at this! Or go leaf through it on Amazon. 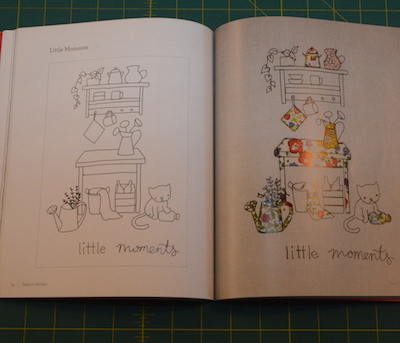 See her sketch on the left page? And then see how she interpreted it with stitching and fabric on the right page? What a wonderful idea! I love how only bits and pieces of the design are embellished with fabric. I want to play with this idea. But what I really did was start a new FMQ project sponsored by the Facebook Group Machine Quilting Tutorials with Jeanne. 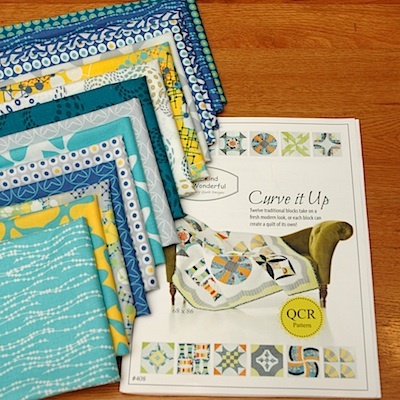 She is teaching a Row by Row quilt this year using FMQ. Here is part of my first row. This design got me thinking about stencils. And about my friend who gave me a large pile of stencils in all shapes and sizes. thinking I could use the stencils and bits of fabric to play around with Minki Kim’s style of design. I dug out my scraps of already fused fabrics left over from making appliqué quilts. 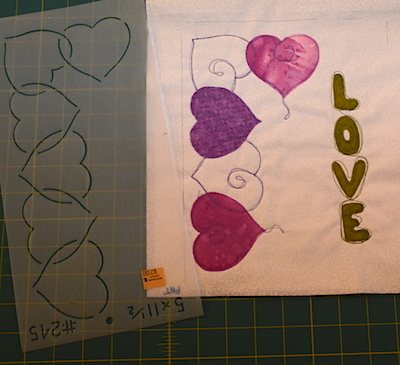 Then using the stencils and fabric I started playing. 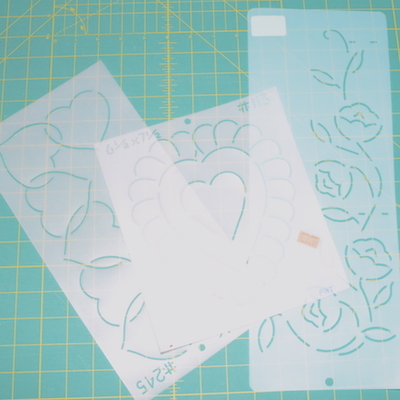 I traced the portion on the stencil I wanted to use on to background fabric. 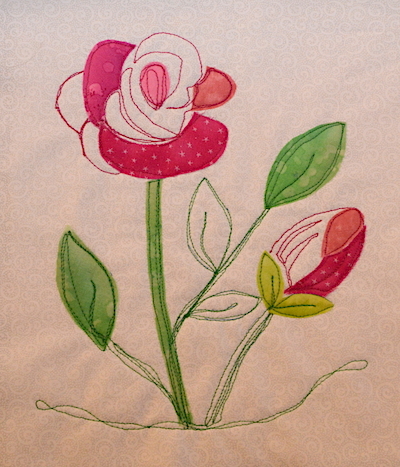 Then traced bits of the leaves, rose bud and flower on the fused fabric. 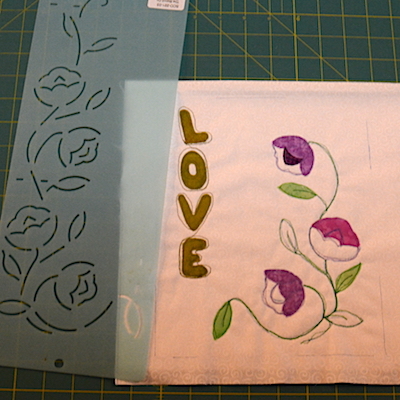 (I use Misty Fuse for machine appliqué quilts, keeping the scraps in ZipLoc bags.) I fused the fabric in place with a hot iron and then had fun stitching around and over the fabrics and along the lines of the rest of the stencil design. So much fun! And I’m loving the look and results! Heart stencil and free hand Love. But that was not enough Crazy for the week. I had visited a quilting friend. We’ve been friends for 20 or so years. As she gets older, her hands are just not cooperating as they once did. She showed me several of her UFOs she had intended to complete and donate to charities. I offered to take them to complete them for her. 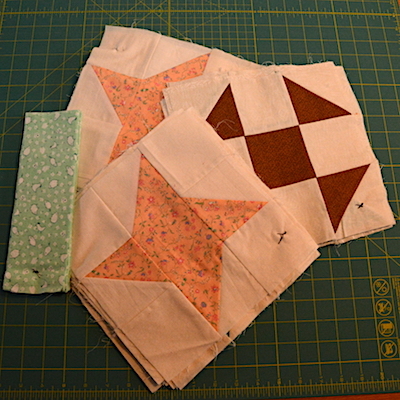 I took 4 sets of 12 blocks each with sashing already cut, which will make 4 baby quilts. You know, not like I don’t have any UFOs of my own! I shared this at my quilting group yesterday and they did think I was crazy! We had a good laugh and I got busy on the first of 4 quilt tops. 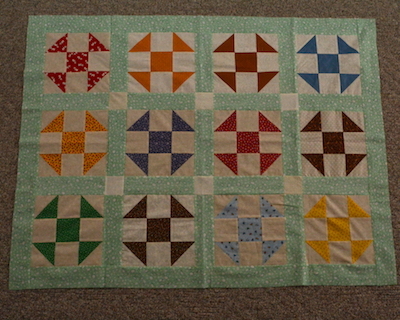 Here’s the first completed baby quilt top. 9″ blocks & 2 1/2″ sashing and border. Top is 37″ x 48 1/2″ My friend has a lovely stash of fabric which I’m sure will provide backing and binding. I’ll take this back to her and see if she wants me to finish it, or perhaps she will want to machine quilt it. That’s my Crazy for the week. It was fun and I hope to be so inspired again! 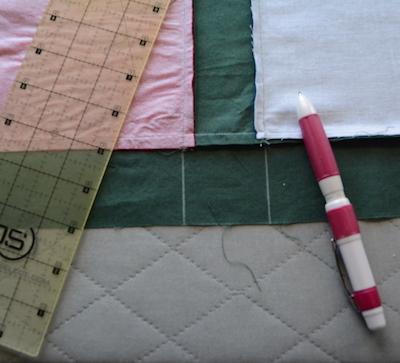 Plans this week will be a repeat of last, temperature quilt, and backs for 2 finished tops. I didn’t get very far on my goal for January which was to work on completing my 2018 temperature quilt. 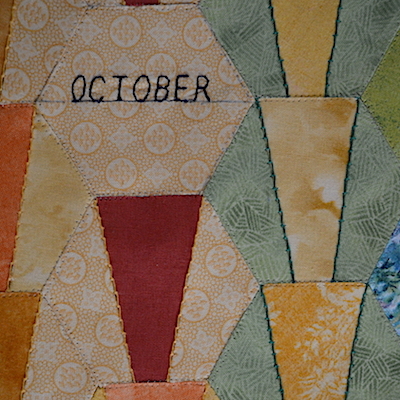 I did pull fabric for embroidering the name of each month. I used the fabric from the low temp of the first day of the month as the background for embroidering the name of the month. The embroidery is all completed. 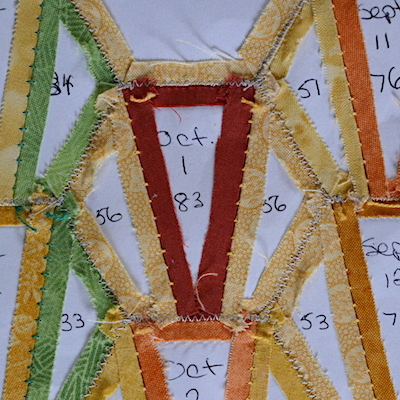 I also decided to embroider the temperature range on each fabric used in the quilt. Small progress for January, but here’s hoping I complete this project this month. I used a Frixion pen to mark lines. Next step, iron the pen marks off. 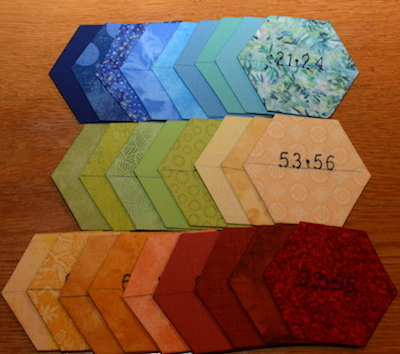 Then it’s time to piece all the hexies together. That will be my goal for February. 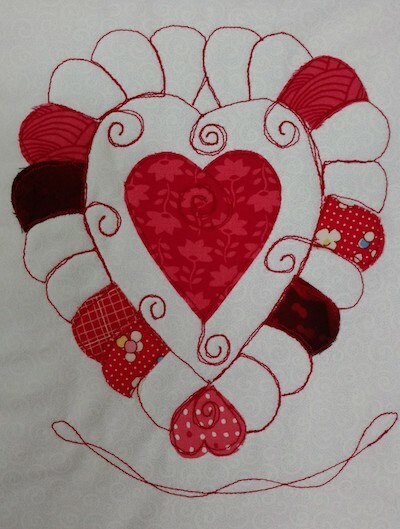 Linking to One Monthly Goal over at Elm Street Quilts. Once the holidays of Christmas and New Years passed, I switched to prepping for an upcoming event. 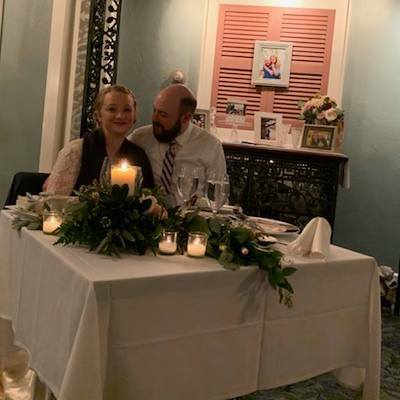 My eldest son married his beloved Saturday, January 19! All the photos I’m sharing are from cell phones of relatives. Professional photos will come later. 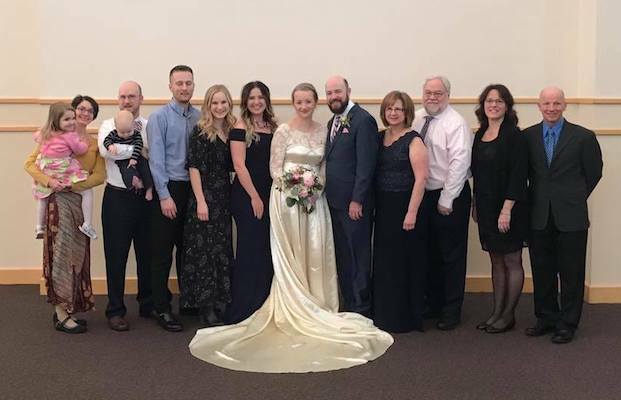 My kiddos, grands, happy newly weds, me & my husband, groom’s aunt & uncle. It snowed all day long, and was so windy. 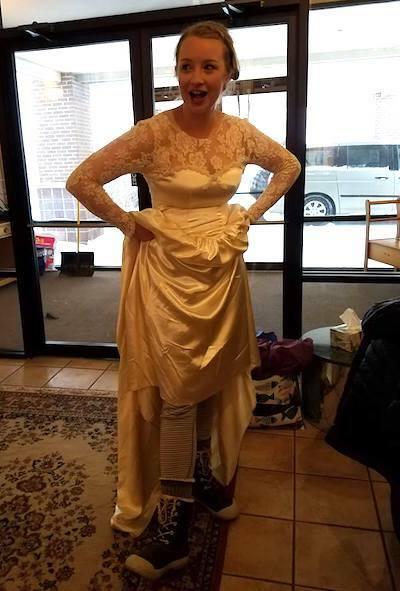 Bride arriving in snow boots and leggings! My kiddos. Son Luke, Daughter Anna, DILove Alicia, Son Noel, Daughter Charis. 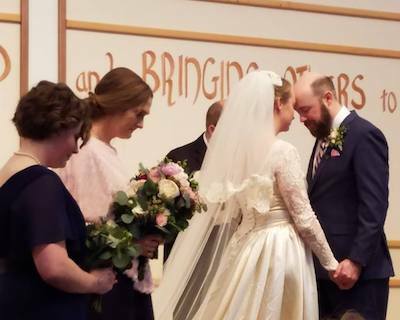 Luke was best man, Charis was also on the groom’s side, but what do you call her, a groom’s person? Wish I had a photo of the whole wedding party. Happy Couple at the reception! My husband, John and me. Sunday morning we hosted a brunch in our home for family and friends before they headed back to their homes. 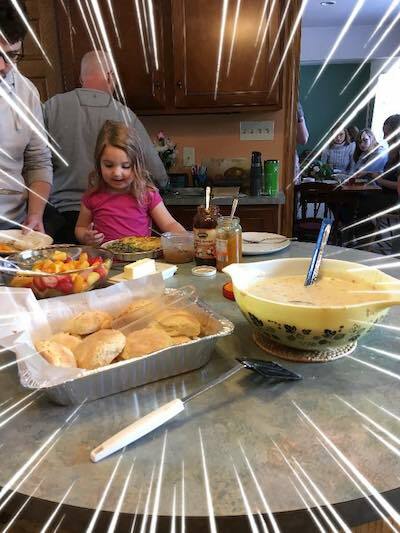 Dear friends, the Roses, made biscuits and gravy for 24 people! We also served quiche, fruit, yogurt & granola, juices & coffee. Fun facts: the wedding gown was my mother’s. Sadly she passed last February, not living to see her gown being worn in her grandson’s wedding. This is the fourth time for it to be used in a family wedding. 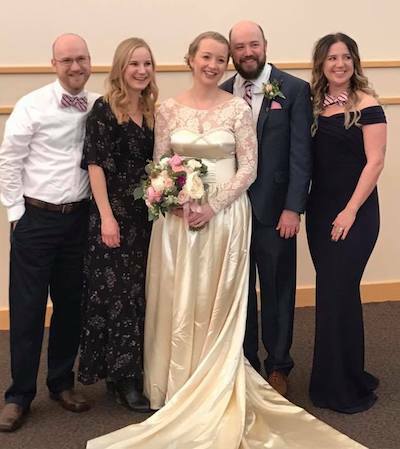 My sister and also my cousin wore the gown at their weddings. The fur stoles worn by my daughter and me are from my husband’s grandmother. 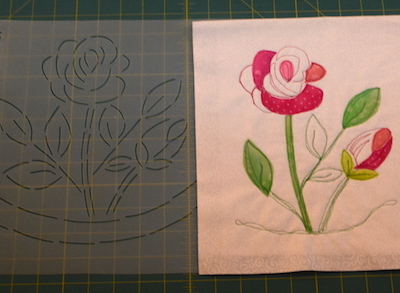 As for sewing this week, I’ll be adding borders to 2 quilt tops for my sister-in-law. She commented on all the quilts in my house. I told her to pick one out. Then showed her a few I would part with and she selected one. Then I took her up to my sewing room, and showed her finished tops that so far do not have homes. She selected 2. But she wants them bed size. I’ll be adding one border to each. And get this! A local quilt shop held a 60% off one item sale yesterday. One item could be up to a 10 yard cut of fabric! We selected fabric to finish the 2 quilts. 10 yards for one and 7 yards for the second, using same fabric for border & back. What a deal! I’m taking a breather today – we had 7 guests staying with us for the wedding. And yes, each bed had at least one quilt on it! Some had 2! We woke up to -8 degrees Fahrenheit Monday morning! Our first guests arrived Wednesday night, and the last of our guests left 6:30pm Monday night! 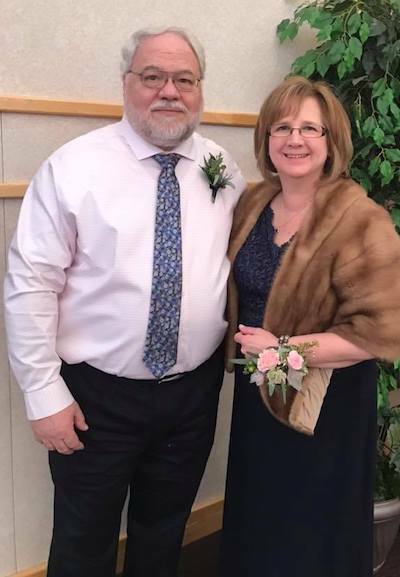 What a full and fun wedding celebration! I’d say the New Year is going extremely well for me. How is your January going? Finishing Helen Godden’s FMQ Christmas ornaments ✗ I really wanted to finish this one up, but wedding prep happily took up my time! Finish 2018 Temperature quilt (I’m giving myself the month of January to finish it.) ✗ Not touched. Start a new project for my soon to be DIL! 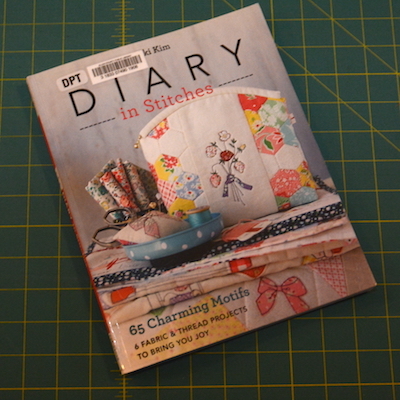 ✔️ DIL selected a pattern, I was able to buy a fabric kit, book and ruler at 15% off. I’ll share more about this quilt once I get going on it. work on 2018 temperature quilt. I have some embroidery of dates and temperatures to do by machine. 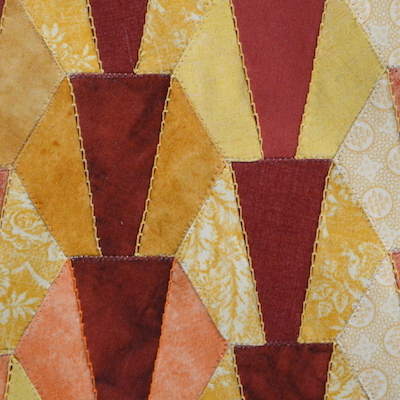 work on adding borders to SIL 2 quilt tops. 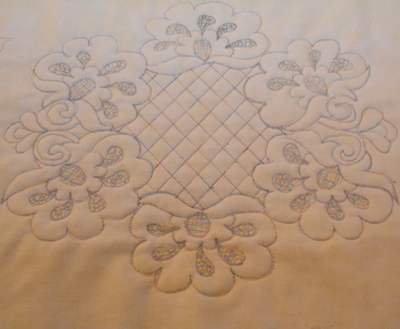 I have a quilting sewing day scheduled with friends for Thursday, I plan on working on the borders then. My goal for January will be to stitch together all of the 365 pieced hexies I made throughout 2018 for my Daily Temperature Quilt. First I want to machine embroider the names of the months and temperature range on the fabric I used. Then I plan on using a monofilament thread and zigzag stitch the hexies together. Fingers crossed my plan works. 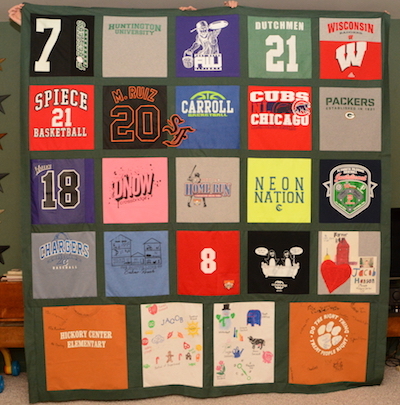 Linking to Elm Street Quilts where Patty hosts One Monthly Goal.